MANUSTRIT Modern Black White Area Rug by Nani Marquina - White Rug with Black Script Font Lettering. This classic Manuscrit Rug was designed by Spanish architect/designer Joaquim Ruiz Millet for Nanimarquina in Barcelona Spain. This stylish area rug is one of the most refined rugs in our collection. A truly timeless design that is a perfect fit in any interior. The Nanimarquina Manuscrit Rug is hand tufted by master artisans in India with 100% New Zealand wool. It is hand tufted with 4,320 knots per square feet (46,500 knots per square meter). This exquisite area rug has become an instant classic with its distinctive timeless features. Very simple, but stylish and genius. Manuscrit is the Latin word for "written by hand". Each person's writing is different from the other and shows special individual particularities. 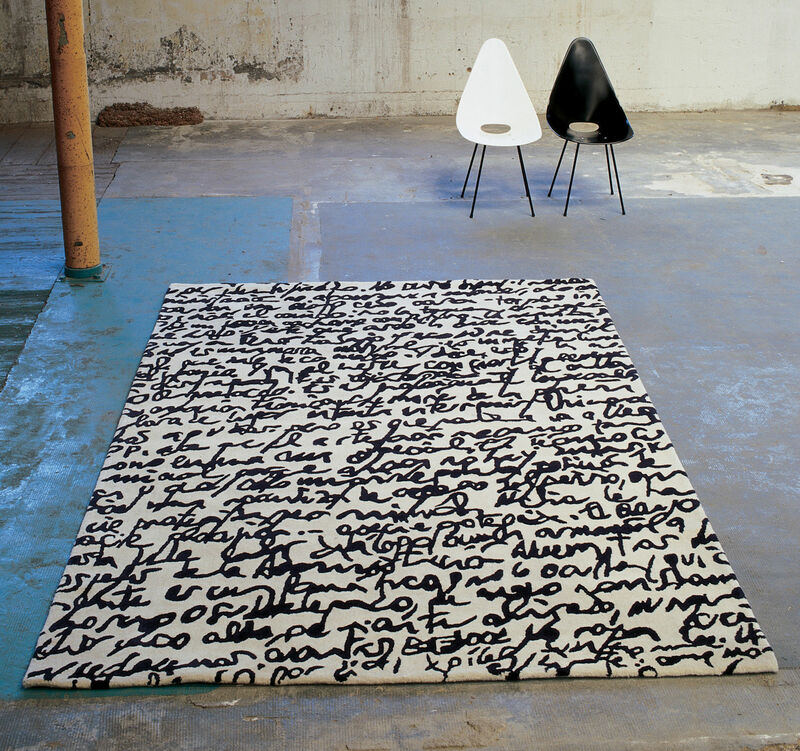 Using age-old Latin Manuscrits as a starting point; the designer created this beautiful rug using an actual paper of one of his manuscripts, written in Catalan, his native language. The black handwriting against the white background creates a spectacular visual effect. Manuscrit is a great example of the rug creations by the Barcelona based design house Nanimarquina. Please allow 1-2 weeks for this rug to arrive.